Being a beauty blogger, having a love of trying out new products comes with the territory. It would be a lie to ever say that I was hoarding beauty products was through necessity (although yes, if anyone asks I do NEED another coral nail polish…) so when I am given the chance to try out new products from a brand that is new to me too, this is quite exciting. This is what happened recently when I was sent an email by the PR for Trish McEvoy, which resulted in being three stand out items from the Trish McEvoy range. One of which is the Lash Curling Mascara in Jet Black. Since mascara is probably my favorite product to test so it makes sense that this is the first I’m reviewing. 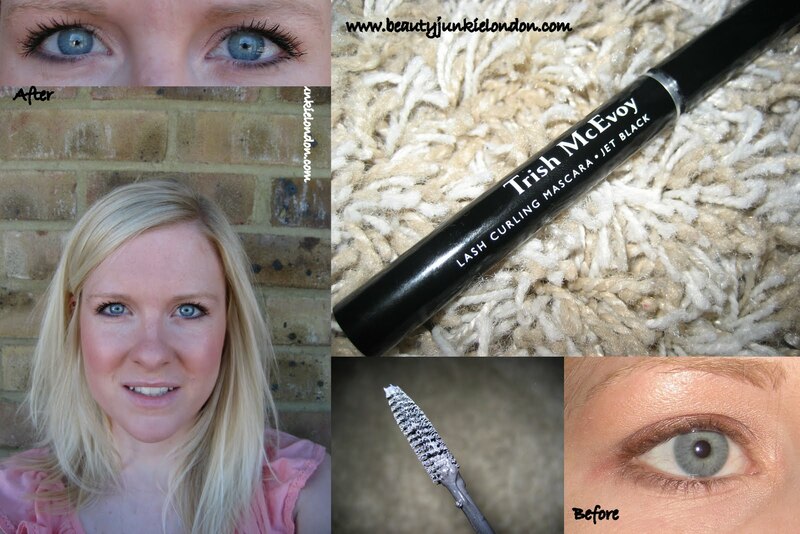 My first impression of this was quite disappointing, I had very high hopes and I was left feeling a bit deflated after first use – the formula felt too wet and seemed to clump around the brushes which had very densely packed bristles. I didn’t find much of a curling effect either – so on first try, it really wasn’t a winner so I put it to the side and didn’t feel all that enthused about trying it again. – the colour really is jet black, I adore how dark this mascara is. – the formula, when dried out a bit created wonderfully defined thick lashes. – a bit of a silly thing to like, but the packaging is nice – a sleek tube that is metal with a plastic coating. It feels sturdy and expensive. Also worth a mention is the removal – it’s not the traditional water=panda eyes, it’s one of the ones that creates ‘tubes’ around lashes and when using a bit of warm water, the tubes basically peel off. At first I wasn’t sure about this, but now I have gotten used to it I find it almost therapeutic – it’s the mascara equivalent of picking a scab or squeezing a spot. Gross comparisons aside, the main plus to this is the lack of panda eyes – removing make-up in the shower is an easy process and can be done without even checking in the mirror. Having tested out a few waterproof mascaras out over the years, I would be inclined to skip them and use something like this instead as even if it comes off in water, which to be frank – I haven’t found a waterproof mascara that doesn’t come off in water – there is no chance of looking like I have two black eyes. I’m afraid there is still a bit of a downside – I haven’t noticed any sort of curling effect. But because of the ease of removal, extremely dark colour and defining power makes this a winner – but it needs a couple of weeks to ‘mature’ (read: dry out a bit) into it’s maximum potential. Of course, you could completely skip my waffle about the intricacies of this mascara and just look at the before/after pictures and make your own opinion. As mentioned above, this was sent free for review. Of course, still being honest – as always! Recently started following your blog and love it already! !